With the introduction of the Evolution, Edge has entered a new realm of the aftermarket diesel industry. 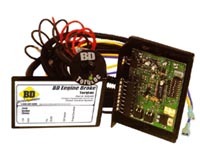 Contained in the tiny module is the capability not only to improve drivability and performance, but also the ability to display and clear trouble codes, remove the speed and rev limiters and adjust power levels. The Evolution connects directly into the OBDII port underneath the dash. Once connected the stock software is downloaded and the new Evolution software is uploaded onto the trucks ECM. All modifications are done during this process and can be just as easily switched back to stock at any time. The Evolution was created with a small lightweight design that allows personalized control with the touch of a button. With a backlit LCD screen, seeing and reading codes has been made simple. The unit not only displays codes, but also displays a description of what these codes mean, which eliminates copying the code down and then finding a manual to look them up. See the Proof!